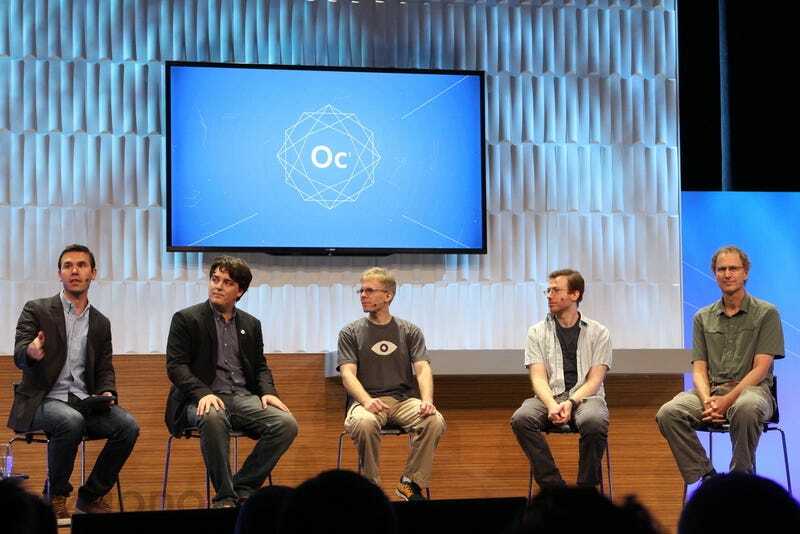 Some of the biggest brains behind the Oculus Rift virtual reality headset are on stage right now chatting about the future of VR, and they've got some bittersweet news. They just don't yet see any way to build a proper controller to go with their incredible headset. Oculus founder Palmer Luckey and famed video game programmers John Carmack and Michael Abrash admit that though controllers are incredibly important to a full VR experience, they just don't know how to do what they really want: put your hands inside the game so you can use them the way you would in the real world. "There's no clear way to do that right now with any technology that we see," says Abrash. "Most of the time when you put somebody, especially a younger child in VR, you really want to see your hands... and really there's nothing there right now," added Carmack. While there are some current systems that do let you see your hands in VR, Luckey says they're still way too laggy to be good enough: "Even if it's working right, if there's any kind of latency it feels like your hand is dead." Later, in the Q&A section of the panel, TechCrunch asked if there are any types of controller that Palmer Luckey and co. currently favor. Not currently; Luckey said that the right type of controller for, say, a gun, wouldn't also be right for a sword or a productivity device. There's no silver bullet. Last year, Luckey told me that Oculus may need to include a gamepad in the short term, even if that's not what he really wants, and there've been numerous reports that Oculus is working on one. One report even suggested the company might announce it at this very conference, but Oculus didn't mention it during this morning's keynote. The new Oculus Rift Crescent Bay prototype. Still, most of the minds on stage seem to believe that VR is already good enough to succeed despite any current missing pieces: though Abrash actually candidly worried that we haven't yet seen any obvious killer apps for VR (echoing my own personal fear), Carmack predicted that tech issues will either be overcome or not matter to the point that VR will be widespread in as few as five years. "We're going to get to the point where literally everyone in the world is going to see something that they want to do," he says. Luckey believes that using VR headsets for social interaction may be key: "When you've got ways to do things that are much more powerful than Skype or chatting on a telephone, that will drive people to use it." There's plenty more discussion of where VR is headed in the full session, which you can now view online.